Spun Sugar Quilts: Auntie Tablecloth on Moda Bakeshop! Here I am tooting my own horn. My newest Moda bakeshop project. I started this project while I was faced with concern about my 2 aunts in Iowa. 2 of my dad's sisters are very ill.
My aunt Patty is only 59 and she had a stroke. She's recovering, but slowly. In addition to that, my aunt Margie is also gravely ill. At 62, she suffers from Emphysema. It appeared that in less than 2 days...we could have been faced with 2 funerals. That was tough on the entire family. For me, living 9 hours away makes it even harder. I turned to my piecing and creating to help me through my worries. I hope it inspires you to focus your worries into something new and beautiful. Beautiful, Vicki!! It was great getting to meet you at market! Vickie, I am so sorry to hear about both of your aunts. 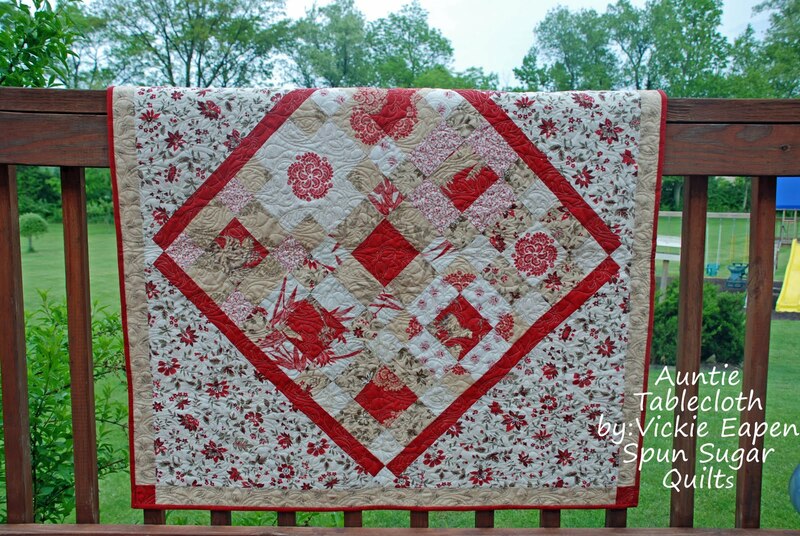 I know that quilting is wonderful therapy and it helps me in difficult times. So I completely understand. The tablecloth is beautiful! You and your family will be in my prayers hoping things are Ok. I turn to piecing when things get over whelming too. Beautiful! I hope your aunts are doing okay. In my thoughts. So sorry to read about your aunts! Hoping they get better everyday! Your tablecloth is lovely! Lovely tablecloth. I do hope that your aunts are doing better. It is so hard to sit at a distance and wait for phone calls. Thank you for sharing the beautiful story behind your project! It will be something for you to remember and share with your girls. Beautiful tablecloth! Your aunts are both so young :( My thoughts are with your family at this time. Beautiful (i love the colors) tablecloth and so sweet to name it Auntie! Fabric therapy, it works every time! Prayers for your young aunts! I'm sorry to hear about your aunts...and yes, quilting is the best therapy! I love this tablecloth...it's gorgeous!